Apparently, 1970 was the year when the American New Left imploded. After the Kent State massacre in May of that year, the nascent sectarian turbulence among leftist activists nationwide became openly internecine ideological conflict. In Seattle, the implosion provoked the demise of Helix, the now-legendary underground newspaper that was founded in March 1967 and abruptly ceased publication in June 1970. Helix editor and illustrator Walt Crowley (1947-2007) would later confirm the implosion’s role in Helix‘s demise. “After Kent State, the left had gone totally wiggy,” Crowley told Seattle Weekly in 1989. “And the drug scene was brutal.” In the wake of Helix, the local media needs of Seattle’s counterculture would be served — if only temporarily — by the more overtly political and brazenly militant newspaper Sabot, whose debut issue was published on the date in focus here. 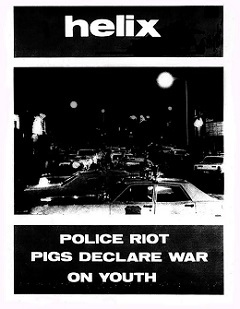 The new paper was founded by the Seattle Liberation Front to fill the alt-journalistic void left in Seattle after Helix. Sabot‘s collective staff crucially included local radical feminists among its leadership, and thus its pages featured critiques of male chauvinism within the contemporary antiwar and black liberation movements. The new paper also reported on the then-ongoing Seattle Seven conspiracy trial as witnessed by trial defendant and Sabot staffer Susan Stern, among others. Noteworthy contributors to Sabot included local underground cartoonist Shary Flenniken and the aforementioned Susan Stern, who would later publish a candid and controversial memoir of her experiences as a radical activist, With the Weathermen: The Personal Journal of a Revolutionary Woman, prior to her tragic death in 1976. Other women involved in the Sabot collective included Py Bateman, who would later found Seattle’s Feminist Karate Union, and Kathy Severn. Just like the fragmented left from which it emerged, Sabot was immediately troubled by political dissonance within its editorial collective, due mainly to an internal power struggle involving feminists over the issues of male chauvinism and editorial control and direction. After just a few months, the divided staff was no longer able to assemble a complete issue together, and the newspaper abruptly ceased publication in January 1971. Nevertheless, some renegade members of the collective would continue to publish sporadic issues for several weeks afterwards. Several former Sabot staff members would later form the Weatherman-influenced George Jackson Brigade collective, which met its demise in a bank robbery and shootout in Tukwila, Washington, on January 23, 1976, during which former staffer Bruce Seidel was killed and the remaining members of the collective were captured. 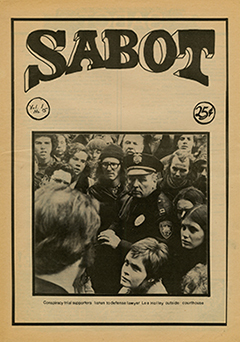 Twenty-four issues of Sabot were published in all. The final issue was published on April 20, 1971. –Jeff Stevens. Sources: “Sabot means wooden shoe,” Sabot, September 11, 1970, p. 2; Susan Stern, “With the Weathermen: The Personal Journal of a Revolutionary Woman” (Doubleday & Company, 1975; Rutgers University Press, 2007); Bart Becker, “The Beats Go On,” Seattle Weekly, November 29, 1989, p. 34; Walt Crowley, “Rites of Passage: A Memoir of the Sixties in Seattle” (University of Washington Press, 1995). Some historical events are merely ephemeral, while others are catalytic, with truly lasting legacies. Such was the case on the date in focus here, when Stokely Carmichael visited Seattle’s Garfield High School and thereby catalyzed the city’s nascent Black Power movement. Carmichael (1941-1998) was then a rising star of the American civil rights movement as chairman of the Student Nonviolent Coordinating Committee (SNCC). He would later join the Black Panther Party, and coined the slogan “Black Power.” Speaking at Garfield to an overflow audience of at least 4,000 persons, he passionately discussed the relationships among language, identity, and power. He defined Black Power as “the coming together of black people to fight for their liberation by any means necessary,” and proclaimed that African Americans should assert themselves politically and no longer be ashamed of their color. His speech had a profoundly transformative effect on the social perspective of many Seattleites, both black and white. Carmichael told the majority black audience, “You have tried so hard to be white that you have gone to Tarzan movies and applauded as Tarzan beat up your black brothers. We have been brainwashed.” While he fiercely criticized White America, about 20 percent of his listeners were white — and many joined in cheering Carmichael that evening. Controversy preceded the event because the Seattle School Board had initially denied Carmichael the use of the Garfield auditorium, but that decision was overruled in the name of free speech by King County Superior Court Judge Frank James. The American Civil Liberties Union also helped win the battle for Carmichael’s right to use Garfield as a venue. Among the many lasting local legacies of Stokely Carmichael’s speech at Garfield are those that began one year later on May 20, 1968, when the UW BSU staged a sit-in on the UW campus that would yield one of the greatest victories in the history of activism in Seattle. The UW BSU sit-in would lead directly to the creation of the Office of Minority Affairs and Diversity, the Ethnic Cultural Center and Theatre, and the American Ethnic Studies department — all crucial UW institutions that remain and thrive in Seattle today. Stokely Carmichael’s truly amazing biography is much too voluminous to detail here. Suffice to say that he was born in the West Indies on June 29, 1941; emigrated to New York City in 1952; attended high school in the Bronx; and enrolled in 1960 at Howard University, where he joined SNCC and became chairman in 1966. That same year in Mississippi, he rallied black people to pursue a new movement that espoused self-defense tactics, self-determination, political and economic empowerment, and racial pride. He would resign as chairman of SNCC in May 1967, and then became affiliated with the more militant Black Panther Party. He left the United States in 1969 and went to live in Guinea, West Africa, where he changed his name to Kwame Touré and helped found the All-African People’s Revolutionary Party, an international political party dedicated to Pan-Africanism and the plight of Africans worldwide. Kwame Touré died of prostate cancer on November 15, 1998, in Conakry, Guinea. He was 57 years old. –Jeff Stevens. Sources: Robert Cour and Walter A. Evans, “Carmichael Rips Into Whites Here,” Seattle Post-Intelligencer, April 20, 1967, p. 1; Lane Smith, “Black Community Power Will End Abuses, Says Carmichael,” The Seattle Times, April 20, 1967, p. 5; Walt Crowley, “Rites of Passage: A Memoir of the Sixties in Seattle” (University of Washington Press, 1995); Thom Gunn, “The times they have a-changed,” The Seattle Times, January 22, 2002, p. B5; Aaron Dixon, “My People Are Rising: Memoir of a Black Panther Party Captain” (Haymarket Books, 2012); Atia Musazay, “Garfield High School’s Black Student Union keeps legacy of activism strong,” The Seattle Globalist, March 1, 2015. –Jeff Stevens. Sources: “2 Groups Challenge Freeway Hearing,” The Seattle Daily Times, September 14, 1961, p. 1; Stub Nelson, “New Delay Looming On Freeway,” Seattle Post-Intelligencer, September 15, 1961, p. 1; “Freeway Delay On Central Part Forecast,” The Seattle Daily Times, September 15, 1961, p. 3; unpublished report by Bureau of Public Roads Area Engineer R. M. Barron, Box 15, RG 30, National Archives, Pacific Northwest Region; Paul Dorpat and Genevieve McCoy, “Building Washington: A History of Washington State Public Works” (Tartu Publications, 1998). When is a newspaper more than a newspaper? On the date in focus here, that question was answered in Seattle with the debut issue of Real Change, our city’s weekly progressive street newspaper. The answer: when the newspaper is also an activist organization. Still unique today among Seattle’s regular print publications, while Real Change is written, edited, and published by a professional staff, it’s sold exclusively by self-employed vendors — many of whom are homeless — working in street locations all around the city. Crucially, the paper provides its vendors with an alternative to panhandling as a source of regular income. Vendors pay 60 cents for each copy of Real Change, then resell the paper for the current $2 cover price plus tips. Journalistically, the paper covers a variety of local social justice-related topics, including homelessness, poverty, and gentrification. “Real Change is a hand up — not a hand out,” goes the paper’s motto. Part of a national street-newspaper movement begun in 1989 by Street News in New York City, Real Change employs up to 400 vendors each month, and currently has a paid weekly circulation of up to 22,000 copies each week. The paper’s founder and director, Tim Harris, previously founded the street newspaper Spare Change in the Boston area in 1992. After moving to Seattle in 1994, Harris started Real Change as a monthly newspaper with only one staff member, operating from a tiny storefront in the Belltown neighborhood. Attracted to Seattle due to our existing homeless advocacy organizations such as Operation Homestead and SHARE/WHEEL, Harris moved here with the specific intention of starting a new street paper similar to Spare Change. The year 1994 was an ideal time to start such a project in Seattle. The city was then at the apex of its most economically prosperous decade to date — yet the city’s underclass was not benefiting from that prosperity. Rather than using that prosperity to help its underclass, the Seattle city government was then drafting and passing legislation — known as the “civility laws” — that essentially punished homeless people for being homeless. These laws were championed primarily by Mark Sidran, the notorious city attorney who held that office from 1990 to 2002. Since its founding, Real Change has compensated greatly for Seattle’s ongoing neglect of its underclass, not only by providing the city’s homeless population with an alternative to panhandling, but also by providing them (and Seattle’s underclass in general) with a crucial voice in city affairs. In a 2010 profile in The Stranger, Harris mused on Real Change‘s uncanny influence within Seattle city politics, and the strategic leverage the paper has provided for the city’s underclass. In recent years, the Real Change Homeless Empowerment Project (an adjunct organization) has led several successful campaigns for economic justice in Seattle. Among these were campaigns to humanize Seattle’s urban campsite clearance policies, stop a proposed new jail from being built, and defeat aggressive panhandling legislation that was unanimously condemned by the Seattle Human Rights Commission. In general, Real Change has achieved increasing success in several ways during the past 20 years. In January 1999, the paper began publishing every other week. In February 2005, encouraged by increasing interest and sales, the paper began publishing weekly. In April 2009, Real Change won national recognition from the Society of Professional Journalists for a story on the life and death of a man who jumped from the Aurora Bridge. In May 2010, the paper’s offices moved from Belltown to more spacious headquarters in Pioneer Square — despite an effort by certain neighboring business owners to prevent the move. In April 2013, Real Change was finally able to translate the success of the paper into an increase in earned income for its vendors — the first in its history. When the paper was founded in 1994, the cover price was one dollar, out of which each vendor earned 65 cents for each copy they sold. They now earn $1.40 for each paper sold. The price change was the result of much research and feedback from Real Change vendors and readers, as well as other street newspapers in other cities. Most recently, in November 2013, the paper expanded its distribution to Bellevue and Bremerton. Real Change currently plans to further expand throughout the Salish Sea region in the near future, and is also developing a phone app that will enable cashless transactions between vendors and customers. –Jeff Stevens. Sources: Maureen O’Hagan, “Street newspaper bucks trend,” The Seattle Times, April 18, 2009, p. B1; Dominic Holden, “Honorary Political Genius: Tim Harris and Real Change,” The Stranger, September 16, 2010; Deanna Duff, “Most Influential: Real Change’s Tim Harris,” Seattle magazine, November 2010; Sara Lerner, “Seattle Street Newspaper Real Change Raises Price,” kuow.org, April 4, 2013; Danny Westneat, “Real Change comes to Bellevue,” The Seattle Times, November 20, 2013, p. B1; Hallie Golden, “Making Real Change,” City Living Seattle, December 12, 2013; Meghan Gelbach, “‘Real Change’ Goes Mobile,” Seattle magazine, February 2014. The summer of 1969 was a time of infamous turmoil in several major American cities, including Seattle. On the date in focus here, a series of riots began in the University District that would shake University Way Northeast — a.k.a. “The Ave” — over several days. During that week, street people on The Ave would battle with Seattle police, leading to several arrests and injuries and much vandalism and looting. While the origin of the riots remains contentious today, the aftermath would lead to significant changes in the character of the U District, both as a neighborhood and as a community. The Ave riots were preceded by an incident across town in West Seattle the previous evening, during a Sunday night rock concert at Alki Beach. Despite the concert being an officially permitted event, several Seattle Police Department officers on the scene began harassing attendees. In response, someone — allegedly a member of a local motorcycle gang — dumped a container of gasoline into the back seat of a police patrol car and threw in a lighted match, setting the car ablaze. The police, in counter-response, abruptly declared the concert over, donned riot gear, and began throwing canisters of tear gas into the crowd — not ordinary tear gas, but rather the CS variety, which sickens its victims. The thick toxic fumes drifted into the nearby neighborhood, thus transforming a peaceful rock concert into a major public disturbance. The following day, in the U District, many regular denizens of The Ave shared news of the Alki fracas with disgust. Police harassment of youth — especially countercultural youth — was a regular fact of life in that neighborhood at that time. (It was also then a regular fact of life citywide, which partially explained the heavy police presence at the Alki concert.) In fact, the police presence in the U District had recently been doubled by Seattle’s acting mayor Floyd Miller as part of a crackdown on drug traffic in the neighborhood. Thus, as the evening of August 11 arrived, many on The Ave were ready for a confrontation with the cops. And thus, the first riot on The Ave that week began at approximately 9 p.m. that night, when a random young man kicked over a trash can at the intersection of Northeast 42nd Street and The Ave. According to witnesses, police officers standing nearby quickly grabbed and handcuffed him. His girlfriend then objected, screaming at the officers and pleading for bystanders to intervene. When the cops grabbed her next, another bystander punched one of the cops, Officer Mike Bolger, in the jaw, and the scuffle quickly escalated into a riot. Spectators began throwing everything they could get their hands on. Bricks struck two other officers, Marvin Queen and Thomas Grabicki, and a stray object shattered the window of the Coffee Corral, a popular hippie hangout on the southeast corner of that intersection. By 9:30 p.m., the crowd of rioters had grown to roughly 150. Witnesses later noted that many in the crowd had also been present at the Alki fracas. More police soon arrived, along with a TV news crew, but by 10:15 p.m. the rioters had drifted away and the police withdrew. All in all that night, seven rioters were arrested and three police officers were injured. The next day, August 12, the U District was buzzing with news of the previous night’s incident. While The Ave was quiet that night, and the police then kept a low profile, the following night would be a different story entirely. While the riot on August 11 may have been politically motivated — some attributed it to the antiwar activists who were a regular part of the Ave scene at the time — the rest of the week’s rioting was evidently the initiative of restless teenagers from across the city coming to the U District strictly for kicks, lured by news of Monday’s incident. The most intense and destructive of the riots would occur on the nights of August 13 and 14 — and most regular U District denizens who witnessed the riots later claimed they did not recognize most of the participants on those nights. The evening of August 13 began with a spontaneous community meeting of about 50 people at 7:30 p.m. on “Hippie Hill,” the stretch of lawn on the University of Washington campus near the intersection of 15th Avenue Northeast and Northeast 42nd Street, then a popular gathering place among Seattle’s countercultural community. The meeting was called to discuss the recent disorder in the U District. Much anger was vented there concerning police harassment, but the apparent consensus was that people should avoid further confrontations with the police. Among the topics of discussion was a pair of flyers that had been circulating in the neighborhood since the morning of August 12. One urged calm in the name of “the New American Community,” while the other was unsigned and much more militant, bearing a sketch of a pistol with the caption “We’re looking for people who like to draw,” an apparent parody of the matchbook ads for art school so common at the time — and an obvious attempt at violent provocation. After the meeting on Hippie Hill adjourned around 8:30 p.m., several attendees headed towards The Ave and immediately noticed two strange things: there were no police visible anywhere; and The Ave was filled with hundreds of teenagers, both white and black, whom no one at the meeting had ever seen in the U District before. 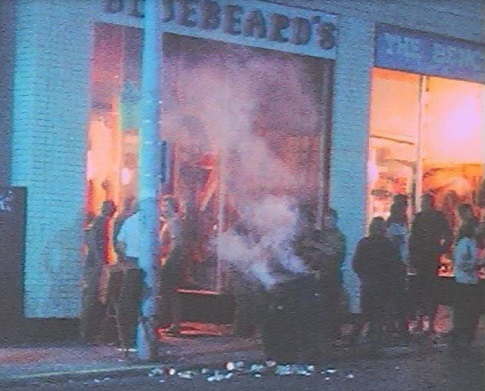 All was calm until around 9:30 p.m., when a group of the unfamiliar teenagers began looting Bluebeard’s, a hippie boutique on the western side of the 4200 block of The Ave. Several locals tried to intervene, proclaiming that Bluebeard’s wasn’t the enemy — but to no avail. Meanwhile, no police appeared, despite the returning chaos. Someone dragged a trash can onto The Ave and lit it on fire — still, no police came. Soon afterwards, scores of Tactical Squad officers in full riot gear charged onto The Ave from nearby alleys, and CS gas grenades began exploding. The rioters, undeterred, began pelting the police once again. As the chaos quickly escalated, trash cans were ignited to bait the police, parking meters were smashed, and stores were looted. Meanwhile, on 15th Avenue Northeast, a mobile crane was set on fire, and when firemen arrived they had to withdraw under a hail of stones. Around 11 p.m., the Neptune Theatre’s evening showing of Franco Zeffirelli’s hit film Romeo and Juliet ended, and hundreds of moviegoers — many themselves young people, the film’s target audience — exited into the middle of the chaos. They were promptly attacked and gassed by police as they attempted to return to their cars. Amazingly, the police never blocked off traffic along The Ave, and several motorists at the intersection of The Ave and Northeast 45th Street found themselves trapped among clouds of tear gas and agitated hordes of teens and police. The chaos that night continued until 3 a.m., and the night of August 13 ended with 21 rioters in jail and three police officers in the emergency room. The night of August 14 was almost an exact replica of the previous night. As dusk fell, some 2,000 young people from outside the U District gathered on The Ave, obviously anticipating further violence. The events of the previous night began to replay promptly at 10 p.m., when a group of teenagers broke into a TV repair shop on the northwest corner of The Ave and Northeast 43rd Street, and also began looting other stores nearby. Squads of cops quickly appeared at that intersection, coming from both north and south and surrounding a crowd of about 200, while a truck-mounted howler sonically swept the street. The cops ordered the encircled mass to disperse — but when the officers moved in, there was nowhere for the crowd to go. Finally, the police opened a narrow gap onto 43rd Street, and people ran out through a gauntlet of clubs and fists. Another crowd gathered at Northeast 45th Street and 15th Avenue Northeast and trashed the brand-new plate-glass windows of the Pacific National Bank building before police chased them away. Eventually, the cops grew tired of the cat-and-mouse fracas and closed The Ave to traffic, then gassed the street from 42nd to 45th with foggers and grenades. All in all that night, the police arrested 21 rioters and roughed up five local news reporters, including KOMO-TV’s Don McGaffin and Brian Johnson. Order was finally restored just before one o’clock in the morning. On August 15, in the aftermath of the riots, police finally detoured traffic from The Ave while volunteers spread out to prevent any further unrest among teenagers. As the community discussed what to do next, everyone agreed that the police could neither prevent nor contain any further violence in the neighborhood. The city was considering ordering a curfew and summoning the National Guard when a delegation of community leaders from the U District met with Acting Mayor Miller and Deputy Mayor Ed Devine. After that meeting, the police agreed to step back and let the community try to handle the situation. The police closed The Ave to traffic at dusk and parked several hundred Tactical Squad officers out of sight nearby, while several volunteers wearing peace-symbol armbands spread out along The Ave. Whenever a significant number of teenagers gathered there, street monitors stepped in to prevent any attempts at looting or vandalism. The same tactic was repeated the following night with equal success. By Sunday, August 17, The Ave was back to normal and the police finally withdrew. The success of the U District community’s response to the Ave riots led to months of negotiations among street people, merchants, residents, clergy, students, police, and city officials, all aiming to reduce police harassment and to establish a community center. Not all of this coalition’s goals were realized, but the U District would become a much more closely-knit neighborhood as a result of the catharsis. Among the other aftermaths of the Ave riots, several of the women who participated later came together and formed the core of the Seattle Weathermen — crucially including radical feminist and antiwar activist Susan Stern (1943-1976), who later became one of the Seattle Seven. Stern would eventually present her own particular interpretation of the Ave riots in her 1975 memoir With the Weathermen: The Personal Journal of a Revolutionary Woman. Despite the initial trauma of the Ave riots, positive and permanent outcomes resulted from the event, including and especially the University District Street Fair, Seattle’s first modern street fair, which continues today. Organized by the University District Chamber of Commerce as one means among many of healing the neighborhood in the wake of the riots and other tumultuous events in the U District during the preceding year, the first University District Street Fair was held during the weekend of May 23 and 24, 1970. –Jeff Stevens. Sources: Lou Corsaletti, “Tear Gas at Alki Beach Justified, Says Ramon,” The Seattle Times, August 11, 1969, p. 1; Roger Yockey, “Gas Bomb Flies Into Home, Explodes,” The Seattle Times, August 11, 1969, p. 4; John Hinterberger, “Beach Residents Still Smarting From Leftover Tear Gas,” The Seattle Times, August 11, 1969, p. 9; Paul Henderson, “Police Study Damage, Complaints After Alki Disturbance,” The Seattle Times, August 11, 1969, p. 9; “3 Officers Hurt in Melee,” Seattle Post-Intelligencer, August 12, 1969, p. 1; “Ramon Claims Alki Tear Gas ‘Best Alternative’ in Fray,” Seattle Post-Intelligencer, August 12, 1969, p. B; Lou Corsaletti, “U. District, Alki Disorders Planned, Says Chief Ramon,” The Seattle Times, August 12, 1969, p. 1; John Hinterberger, “Merchants Worried, Relieved After Fracas,” The Seattle Times, August 12, 1969, p. 15; Mike Wyne, “3 Officers Hurt In Youth Melee,” The Seattle Times, August 12, 1969, p. 41; “‘Fed Up,’ Says U Area Merchant,” Seattle Post-Intelligencer, August 13, 1969, p. 1; “After Tear Gas, Child Fears Police” (letter to the editor), The Seattle Times, August 13, 1969, p. 11; Walt Crowley, “Power vs. People,” Helix, August 14, 1969, p. 2; “Police Battle Rock-Hurling, Looting Gangs in U District,” Seattle Post-Intelligencer, August 14, 1969, p. 1; “U District Has Look of War,” Seattle Post-Intelligencer, August 14, 1969, p. 12; John Hinterberger, “Police Showed Restraint Before Violence Erupted in U. District,” The Seattle Times, August 14, 1969, p. 1; “Chief Ramon Calls Violence ‘Planned Attack on Police’,” The Seattle Times, August 14, 1969, p. 1; “University Area Merchants Urge ‘Reasonable Force’,” The Seattle Times, August 14, 1969, p. 3; Shelby Gilje, “‘Unbelievable’: U. District Movie Treat Turns To Terror for Mother, 2 Girls,” The Seattle Times, August 14, 1969, p. 7; Mike Wyne, “21 Arrested, Three Injured as Youths, Police Battle,” The Seattle Times, August 14, 1969, p. 8; John Hinterberger, “It Began on 2 Notes: Retaliation . . . Restraint,” The Seattle Times, August 14, 1969, p. 8; “Police Riot-Control Tactics” (editorial), The Seattle Times, August 14, 1969, p. 10; “Looting, Smashing Youths Run Wild On U Way Again,” Seattle Post-Intelligencer, August 15, 1969, p. 1; “U District Merchants Support Police Action,” Seattle Post-Intelligencer, August 15, 1969, p. B; James C. Lewis, “(Teary) Eyewitness at Riot,” Seattle Post-Intelligencer, August 15, 1969, p. B; “Mayor Studies Need For U. District Curfew,” The Seattle Times, August 15, 1969, p. 1; Mike Wyne, “23 Persons Arrested,” The Seattle Times, August 15, 1969, p. 2; “Injured,” The Seattle Times, August 15, 1969, p. 2; Susan Schwartz, “Some Watched, Others Acted,” The Seattle Times, August 15, 1969, p. 2; “Police-Baiting That Backfired” (editorial), The Seattle Times, August 15, 1969, p. 10; “Clothing Store Loot Loss $2,012,” Seattle Post-Intelligencer, August 16, 1969, p. B; “Lull Settles on U District,” Seattle Post-Intelligencer, August 16, 1969, p. B; Mike Wyne, “Role-Switching Works to Cool U. District,” The Seattle Times, August 16, 1969, p. 8; “Bluebeard’s Loss Exceeds $2,000,” The Seattle Times, August 16, 1969, p. 8; Julie Emery, “U. District ‘Cool-It’ Movement Praised,” The Seattle Times, August 16, 1969, p. 8; “15 Plead Innocent To U. District Disturbance,” The Seattle Times, August 16, 1969, p. 8; “Police Force In U District To Be Cut,” Seattle Post-Intelligencer, August 17, 1969, p. 6; Don Hannula, “U. District Acts to Defuse Tensions,” The Seattle Times, August 17, 1969, p. 1; “Candidate Criticizes Unrest Handling,” The Seattle Times, August 17, 1969, p. 25; Michael J. Parks and Paul Andrews, “The University District: Both Sides Share Blame, Witnesses to Disorders Agree,” The Seattle Times, August 17, 1969, p. 49; “Helix Riot Report,” Helix, August 21, 1969, p. 8; Susan Stern, “With the Weathermen: The Personal Journal of a Revolutionary Woman” (Doubleday & Company, 1975; Rutgers University Press, 2007); Walt Crowley, “Rites of Passage: A Memoir of the Sixties in Seattle” (University of Washington Press, 1995). The spring of 1970 was an intense time to be a radical in Seattle. The members of the Seattle Liberation Front (SLF) knew that all too well on the date in focus here, when eight of them were indicted by a federal grand jury for the charge of conspiracy to incite a riot. The SLF was a radical anti-Vietnam War organization formed in January 1970 at the University of Washington. The indictments were prompted by a demonstration in front of the United States Federal Courthouse in downtown Seattle on February 17, 1970. The demonstration was organized by the SLF to protest the controversial Chicago Seven conspiracy trial, the verdict of which was expected that same day. During the demonstration, approximately 2,000 protesters clashed with Seattle police, pelting the courthouse and the police with rocks and paint bombs, and leading to 76 arrests and 20 injuries. Charges were filed on April 16 against Michael Lerner (b. 1943), Susan Stern (1943-1976), Charles Clark “Chip” Marshall III (b. 1945), Michael Abeles (1951-2016), Jeff Dowd (b. 1949), Joe Kelly (b. 1946), Roger Lippman (b. 1947), and Michael Justesen (b. 1950). These SLF members then became known as the Seattle Eight and, after Justesen disappeared, the Seattle Seven. The SLF consisted mostly of former members of Students for a Democratic Society (SDS), which had collapsed the previous summer due to internal dissent at its national convention. It was deeply ironic that the February 17 demonstration was organized to protest the Chicago Seven trial, since the Chicago defendants had also been indicted for conspiracy in planning protests during the August 1968 Democratic National Convention in Chicago — an event which had also turned violent. The Seattle event, along with several others held nationwide that same day, was called “The Day After” (TDA) in anticipation of the Chicago verdict. The violence in Seattle occurred despite the SLF’s stated wishes for a peaceful demonstration. The SLF had in fact been created as a nonviolent alternative to the Weathermen, the SDS-derived radical organization that openly advocated violent tactics against the Vietnam War. Nevertheless, the SLF was blamed for the February 17 riot, and the indictments thus followed. Five of the Eight were arrested on the same day the indictments were issued: Lerner, Stern, Abeles, Dowd, and Kelly. Marshall was arrested two days later at the Century Tavern on The Ave in the University District, where the SLF were then known to congregate. Lippman was already in jail in Berkeley, California, having been arrested the day before in conjunction with an antiwar protest there, while Justesen immediately went underground to avoid arrest. All of the Seven were soon released on personal recognizance pending trial. Some SLF members and supporters suspected that the timing of the indictments was intended to provoke a riot at an antiwar march in downtown Seattle planned for that weekend on April 18. Stephanie Coontz, then a leader of the UW’s Student Mobilization Committee, told The Seattle Times about that suspicion on April 17. The Seattle Seven were tried in Tacoma before Federal District Judge George Boldt (1903-1984). The pre-trial hearing occurred on November 6, 1970. The trial was quickly sabotaged by the defendants’ vocal disruptions, a protest walkout, and their eventual refusal to enter the courtroom. Because of these antics, Boldt declared a mistrial on December 10, 1970, and cited all seven defendants for contempt of court. He then summarily sentenced them all to six months in prison and refused to grant bail. While most of the Seattle Seven eventually did serve time for Boldt’s contempt charges, the original conspiracy charges against them were unsuccessfully prosecuted. 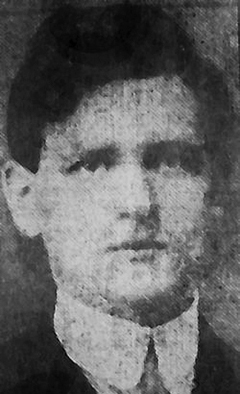 Most observers agreed that the prosecution’s case was weak, and the defense was aided greatly by the admission of the prosecution’s key witness, Horace “Red” Parker, that he had played a covert role in instigating the violence at the February 17 demonstration. The contempt charges were settled in court on March 28, 1972, and the Seattle Seven, save for Lerner, all served brief sentences in federal minimum security prison. The original conspiracy charges were quietly dropped in March 1973. During the trial’s conclusion, the SLF succumbed to internal dissent and disbanded acrimoniously in late 1971. As for the other aftermath, Stern died in 1976 at the age of 33 of heart and lung failure due to an accidental drug overdose. Justesen was arrested in 1977 in California by the FBI as part of an infiltration of the Weather Underground. Lerner is currently an ordained rabbi and editor-in-chief of the progressive Jewish journal Tikkun. Dowd eventually became a cineaste and helped found the Seattle International Film Festival in 1976. He’s now most famous as the inspiration for “The Dude,” the celebrated fictional character from the classic Coen Brothers comedy film The Big Lebowski. Among the many things the Seattle Seven and the Chicago Seven had in common, the most important historically is that both were ultimately examples of government intimidation of antiwar activists by way of the American legal system. In both examples, a group of loosely affiliated activists was charged with conspiracy to incite a riot that was in fact beyond their control; in both examples, the prosecution’s case was ultimately too weak to withstand courtroom scrutiny. Today, history has proven much kinder to the memory of these two kindred groups than to the war that ultimately created them. –Jeff Stevens. Sources: Don Carter and Larry McCarten, “Grand Jury Indicts 8; Lerner, 4 Others Held,” Seattle Post-Intelligencer, April 17, 1970, p. 1; Don Carter and Larry McCarten, “Indicted 8 Linked to 2 Named in U Post Office Bombing,” Seattle Post-Intelligencer, April 17, 1970, p. B; “Half at Courthouse Melee Took Active Roles,” Seattle Post-Intelligencer, April 17, 1970, p. B; Dee Norton, “8 Indicted for Conspiracy,” The Seattle Times, April 17, 1970, p. A; “Officials Give Background Of Those Indicted,” The Seattle Times, April 17, 1970, p. A14; “Indictments Here Termed Provocation,” The Seattle Times, April 17, 1970, p. A14; Don Hannula, “New Cause at U.W. : ‘Free Seattle Eight’,” The Seattle Times, April 17, 1970, p. A14; “Judge Lowers Bar for ‘Seattle 5’,” Seattle Post-Intelligencer, April 18, 1970, p. 1; “S.L.F. Target Of U.S. Plot, Say Members,” The Seattle Times, April 18, 1970, p. A11; “UW Regents Won’t Act Against Lerner,” Seattle Post-Intelligencer, April 19, 1970, p. 1; Don Hannula, “Seven plead no contest,” The Seattle Times, February 23, 1972, p. B8; Dee Norton, “Some of conspiracy defendants sentenced,” The Seattle Times, March 28, 1972, p. A4; “U.S. closes books on ‘Seattle 7’ case,” The Seattle Times, March 27, 1973, p. C7; Susan Stern, “With the Weathermen: The Personal Journal of a Revolutionary Woman” (Doubleday & Company, 1975; Rutgers University Press, 2007); Dennis P. Eichhorn with Cynthia King, “Seven-Up Seattle style,” The Rocket, May 1987, p. 23; Roger Lippman, “Looking Back on the Seattle Conspiracy Trial” (http://terrasol.home.igc.org/trial.htm, December 1990); Walt Crowley, “Rites of Passage: A Memoir of the Sixties in Seattle” (University of Washington Press, 1995). Seattle’s history as a pro-labor town dates back well before the famous 1919 General Strike. It goes back in fact at least twenty years before that much-discussed event — specifically to the date in focus here, when the Seattle-based Western Central Labor Union (WCLU) voted to approve a proposal to publish a pro-labor newspaper in Seattle. The debut issue of the resulting paper, the Seattle Union Record, was published on February 20, 1900, under the ownership of the WCLU and the editorship of Gordon Rice, who had edited the short-lived Labor Gazette in 1894. The Union Record was originally published as a weekly paper, 6-8 pages in length, until April 1918, when it became a daily paper. Rice edited the paper until 1912, when Erwin Bratton “Harry” Ault (1883-1961) was chosen as its editor. Born in Newport, Kentucky, and raised in Washington state, Ault came to the Union Record from a long career working for newspapers, beginning as a newsboy at the age of five and working up to the positions of editor and publisher. Most of the papers Ault had then worked for were openly progressive in nature, including The Weekly People and The Socialist. He would go on to edit the Union Record until its final issue, dated February 28, 1928. Under Ault’s editorship, the Union Record‘s daily circulation would steadily increase from 3,000 to 80,000 at its peak. Later, of course, the paper would become most famous for publishing Anna Louise Strong’s incendiary “No One Knows Where” editorial, which would help foment the 1919 General Strike. 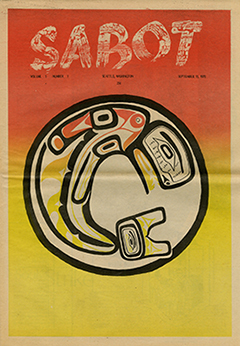 Despite its labor background and ownership, the Seattle Union Record was not merely a newsletter of the WCLU, but rather a full-coverage newspaper, covering local, national, and international events. While its core target audience always remained union members, it always aspired to compete with Seattle’s other daily newspapers for a general audience. Its ultimate achievement today remains its historical status as both America’s first labor-owned daily newspaper and the longest-running. –Jeff Stevens. Sources: Murray Morgan, “Skid Road: An Informal Portrait of Seattle” (Viking Press, 1951; Ballantine Books, 1971; University of Washington Press, 1982); Mary Joan O’Connell, “The Seattle Union Record, 1918-1928: A Pioneer Labor Daily,” M.A. thesis, University of Washington, 1964; John J. Reddin, “The Union Record Recalled — First Hand,” The Seattle Times, November 8, 1967.